Life…it gets in the way sometimes. Maybe not intentionally, but life happens! You know the old saying, when life hands you lemons, make lemonade? 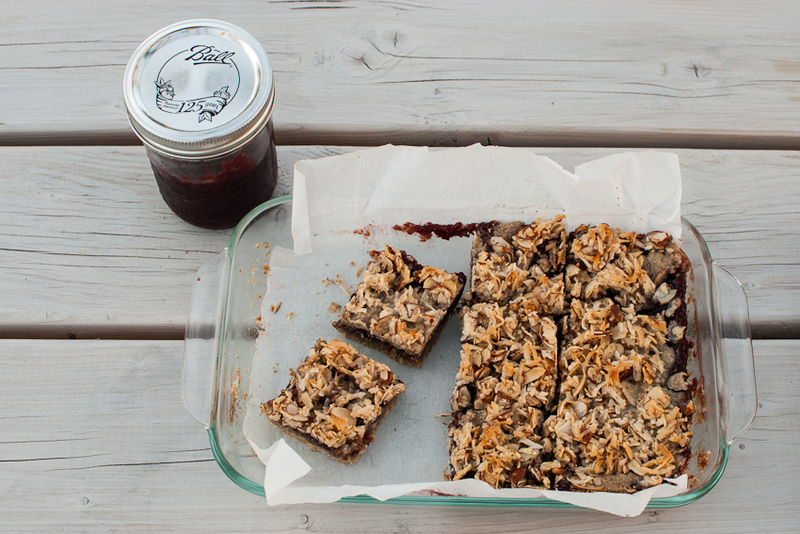 Well forget that… you need to make these intense raspberry coconut gluten free bars! Let the lemons have a break for once, get that jar of homemade jam out of the cupboard and get to work on these bad boys. Ok, you may be asking, why gluten free? really? are they going to taste like sand paper or cardboard? Well, you will be amazed at how sweet these taste! I think these bars are part of the reason why Andrew fell in love with me. Yup, it’s these bars! The first time I made him these, he was in raspberry-coconutty-sugary bliss! I think he even asked me about ten times if these were gluten free, haha! Last summer, as with every summer, we have this tradition to go pick berries and make our own jam. It’s so much fun and you can control how much sugar goes into your jam. Every thing tastes ten times better when it’s homemade! 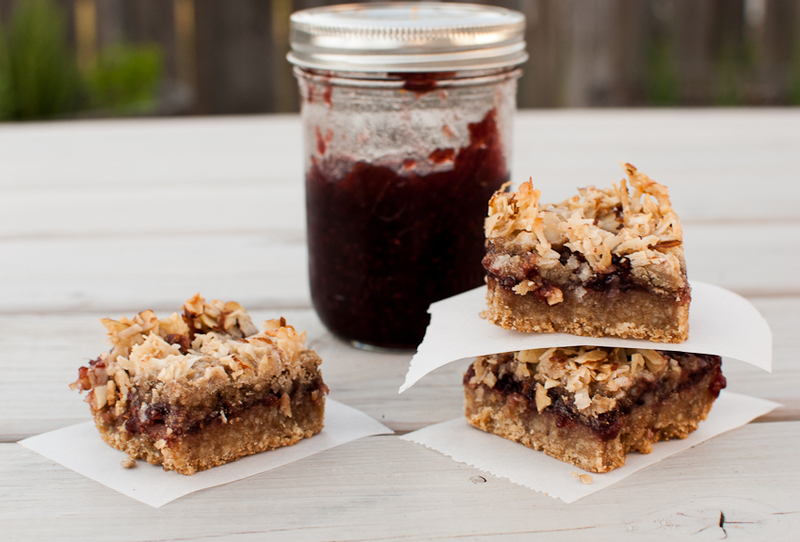 For these bars, I used our raspberry jam, one 12 oz jar is all you need. If your jam is sweeter, you may want to cut back a bit, unless you love super sweet treats. Any jam will work with these, blackberry, blueberry, boysenberry… throw caution out the window and use whatever you have on hand! I never go exactly by a recipe. I might make it once as it’s written, but then throw in my own twist and flavors the next time around. 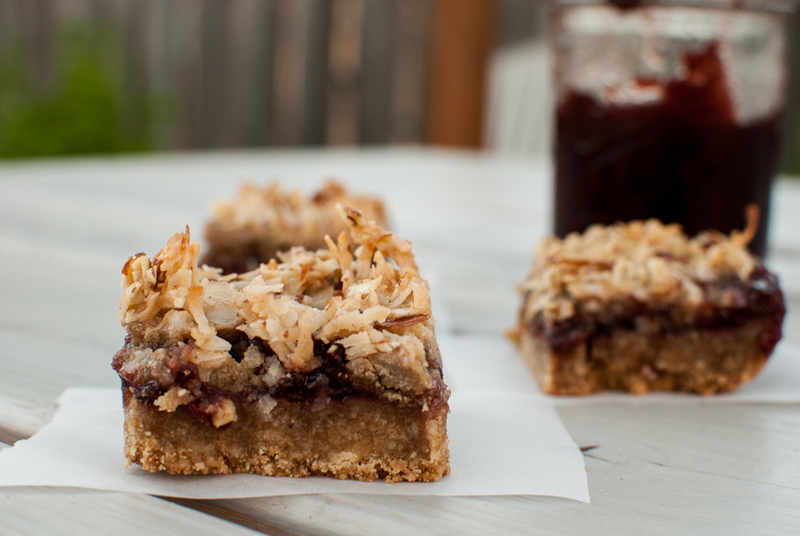 I know, you may be thinking….wow, there are a lot of ingredients in this cookie bar, but they are worth it! Once you buy all the flours and the coconut oil, they last a long time. You can make several batches of these bars with all the ingredients you buy. I also buy all my flours at Bob’s Red Mill. A great value for your dollar. If you don’t have access, you can buy on line, or head over to Whole Foods. Recipe adapted from The Gluten Free Goddess. 12 oz jar of raspberry jam or other flavour of jam, be creative! Line a 9x13 pan with parchment paper, having a little hang over the sides to lift the bars out at the end. First, make the bottom crust. Using a pastry cutter or food processor, cut in the vanilla with the coconut oil. In a separate bowl, whisk together the flours, salt, sugar, and spices. Then add the flour mixture to the coconut oil mixture, using a pastry cutter. Mix should be crumbly. Put into prepared pan, and press firmly. Bake for 7-9 minutes, until just set. Remove from oven, and keep oven on. Next make the topping, add the sorghum flour and brown sugar together in a bowl. Next add the vanilla and 5 Tbsp of butter. Cut in the butter with a pastry cutter. Mixture will be crumbly. Set aside. Now make the coconut topping. Melt the 4 Tbsp of butter in a small saucepan, remove from heat. Add the coconut, slivered almonds, and vanilla. Mix until combined. Bake for 22 minutes. The jam should be bubbly and the topping a little brown. Let the pan cool on a wire rack for about 15 minutes. Left the bars out with the parchment paper, and place on a cookie sheet and into the freezer for 20 minutes. They need to cool and be chilled before you cut into them or you will have one big gooey mess! Cut the bars into 18-20 squares. Spread the love and make new friends!